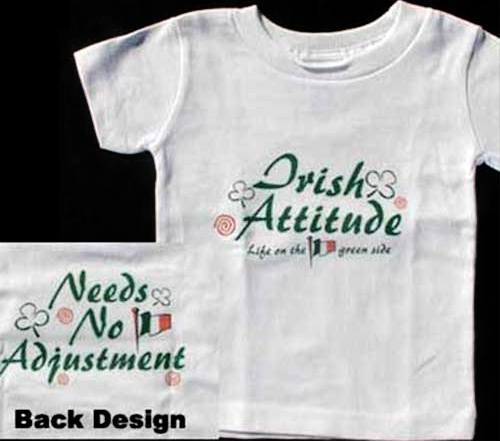 The Irish attitude t-shirt is available in baby, toddler and child sizes. The text on this Irish t-shirt for children says: Irish Attitude along with Life on the green side on the front and Needs No Adjustment on the back. This Irish t-shirt for both baby and child is enhanced with colorful shamrocks and Celtic spirals along with the Irish flag. The pre-shrunk, 100% cotton t-shirt for Irish children and toddlers is a white color shirt with imprinted designs on both sides. The Irish attitude t-shirt features a ribbed crew neck along with a double stitched hem.